Groupon stock was taking a beating Wednesday after releasing its earnings report for the third quarter of 2018. 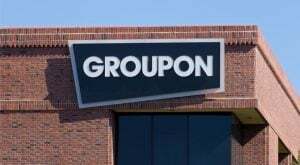 Groupon (NASDAQ:GRPN) is reporting revenue of $592.88 million for the third quarter of the year. This is a drop from the company’s revenue of $634.47 million reported in the same period of the year prior. It was also bad news for Groupon stock by missing Wall Street’s revenue estimate of $601.89 million for the quarter. According to Groupon, revenue was down during its most recent quarter for a couple of reasons. This includes the company seeing lower customer traffic during the quarter. It also notes that its focus on ” revenue generation that maximizes longterm gross profit” is partially to blame. During the third quarter of 2018, Groupon reported earnings per share of 4 cents. This is an increase over the company’s earnings per share of one penny from the third quarter of 2017. It also came in above analysts’ earnings per share estimate of 2 cents for the period, but wasn’t enough to save Groupon stock today. Net income reported by Groupon for the third quarter of the year came in at $24.62 million. The e-commerce company’s net income reported during the same time last year was $59,000. Groupon’s earnings report for the third quarter of 2018 also includes operating income of $53.02 million. This is an improvement over the company’s operating loss of $1.21 million reported in the third quarter of the previous year. GRPN stock was down 9% as of Wednesday afternoon and is down 37% year-to-date. Article printed from InvestorPlace Media, https://investorplace.com/2018/11/groupon-stock-slides-on-revenue-miss/.